Jishukan Ryu Australia was founded by Col. James Laughlin who retired from active participation in December 1990 and sadly passed away in 1993 having attained the honorary grade of 8th Dan and title of Saiko Komon (Supreme Councillor). A number of organisational structures have been adopted over the history of the organisation, each with approval of the Honbu. The current organisational structure is as follows. The Council in Australia is responsible for the grading, appointment and promotion of members to shodan and above, development of the syllabus, contact with the Honbu in Japan, and the establishment of general policy. 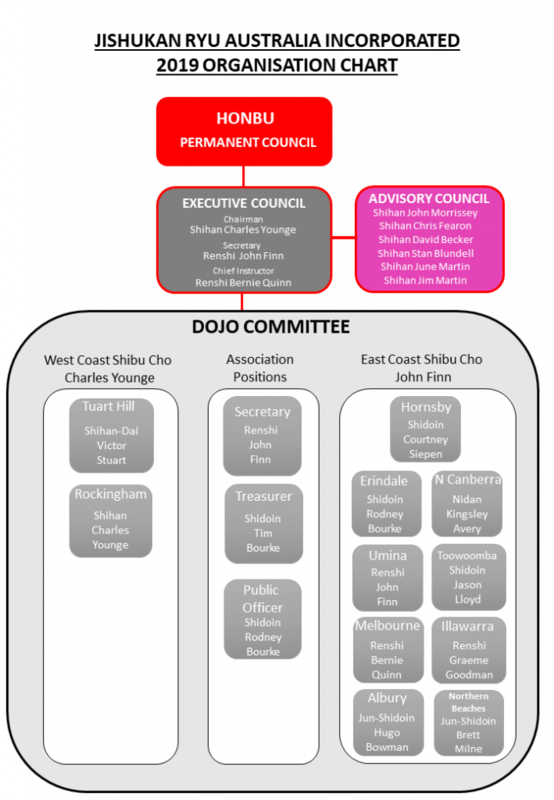 Under the Rules of Jishukan Ryu Australia Inc, the functions of the Council are shared between two bodies – the Executive Council and the Advisory Council. From the Dojo Committee, two (2) Dojo Heads are selected to be Shibu Cho, or Area Commanders, for the Eastern and Western halves of Australia. The role of the Shibu Cho is the management of regional and interclub matters and affairs and coordination of regional and interclub events in the East and West of Australia respectively. Currently the Shibu Cho for the West of Australia is Shihan Charles Younge and the Shibu Cho for the East of Australia is Renshi John Finn. The organisational structure of Jishukan Ryu Australia Inc described above is summarised in the chart below.